Russian oil company Rosneft announced it has ordered two Aframax crude oil tankers to be built at Russia's far eastern Zvezda shipyard for scheduled delivery in 2022. The Russian-flagged vessels will have a deadweight of 114,000 metric tons and a 1A/1B ice class, which makes them able to operate in icy conditions year round, including in sub-Arctic seas and Russian ports of the Baltic region, said Russian shipping company PAO Sovcomflot (SCF Group). According to the documents, Arctic Leasing will place orders for construction of the two Aframax tankers at the shipyard, which under the leasing agreement will be put into operation by SKF Eco, an arm of SCF. Rosneft and SKF Eco will sign two 20-year time charter contracts for export deliveries of crude oil and petroleum products from the Russian Baltic ports. VEB-Leasing will finance the construction of the tankers. After the charter period is over, the vessels will become the property of Rosneft. Designed to operate on liquefied natural gas (LNG) fuel, the tankers will meet high environmental standards and new regulations for restriction of sulphur oxide and greenhouse gas emissions in the Baltic and Northern Seas that will take effect in 2020. The technical specification of the vessels was designed by speacialists from SCF, who applied their experience of operating large-capacity tankers in ice conditions, in cooperation with Russian shipbuilder Far Eastern Shipbuilding and Ship Repair Center (FESRC) and South Korean shipbuilder Hyundai Heavy Industries, a technological partner Zvezda Shipbuilding Complex. Rosneft is now the second charterer, after Shell, to choose Sovcomflot's so-called 'Green Funnel' cleaner-burning Aframax tankers. With the latest order, the portfolio of orders for this vessel type grown to a dozen. 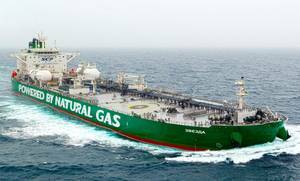 "We welcome the plans of the Russian shipbuilders, from Zvezda Shipbuilding Complex, to create modern large-capacity vessels using natural gas-based bunkers (LNG) as their primary fuel. I'm sure that it is with such vessels that the future of merchant shipping lies," said Sergey Frank, President and CEO of PAO Sovcomflot. Frank attended the signing ceremony during the 4th Eastern Economic Forum (EEF) alongside Vladimir Putin, President of the Russian Federation; Igor Sechin, CEO, Chairman of the Management Board, Deputy Chairman of the Board of Directors of Rosneft; and Artem Dovlatov, Acting Director General of VEB-Leasing.